This technique involves the use of penetrating gamma or X-radiation to examine parts and products for imperfections. An X-ray machine or radioactive isotope is used as a source of radiation. Radiation is directed through a part and onto film or other media. The resulting shadowgraph shows the internal soundness of the part. - The radiation used in radiography testing is a higher energy (shorter wavelength) version of the electromagnetic waves that we see as visible light. 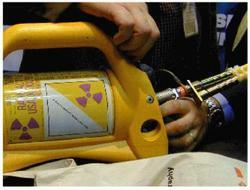 The radiation can come from an X-ray generator or a radioactive source. - The part is placed between the radiation source and a piece of film. Radiographic testing used to inspect almost any material for surface and subsurface defects. X-rays can also be used to locates and measures internal features, confirm the location of hidden parts in an assembly, and to measure thickness of materials. AllScan NDT has experienced Level I, II, III professionals to carry out the tests and interpretations accurately. Radiography is an excellent non-destructive testing method to identify internal discontinuities for most common materials. Saisrushti radiographic department utilized advance equipment, highly trained workforce, excellent safety system to provide high quality and accurate results through an electronic reporting system. Being a reckoned name in this domain, we are providing Radiographic Testing Service to our clients. This Radiographic Testing Service is executed by expert professionals with using new technology and machinery. To attain the maximum satisfaction of our customers, we are providing our services at market leading prices. Radiographic testing method is useful for the detection of internal flaws in many different materials and configurations especially used for quality assurance of castings, forgings and welds. An appropriate radiographic film is placed behind the test specimen and is exposed by passing either X-rays or gamma rays through it. ITH provides a variety of radiography services for an array of applications and industries. Gamma (Iridium) and X-ray inspection methods are used for profile radiography, field and piping welds, investment castings and heavy wall vessel inspection. Computed and Digital Radiography services are also available that permit lower source strengths and lower radiation exclusion zones. 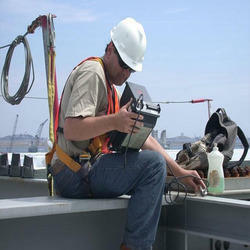 Radiography testing is part of non destructive testing this is used for testing the mechanical welding (i.e.